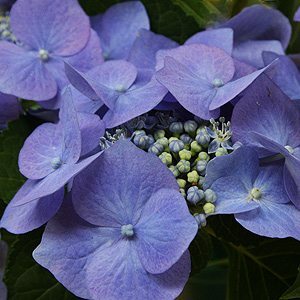 Probably the most widely grown species of all, Hydrangea macrophylla. Originally from Japan and China and flower as white to pink of blue depending on soil ph. Long flowering from spring through to summer. In this group we have Mop Tops and Lacecaps, the Lacecap, botanical name Hydrangea macrophylla ‘Normalis’ (picture right) is probably underused by many gardeners as it is a very attractive flowering plant, a little more delicate than the Mophead type, an excellent plant for the border. Left to their own devices the species can reach around 3m, however they are commonly pruned to 1 – 1.5m. These plants look great in the garden border and are also suited to shaded positions in cottage gardens. Look for other interesting species and cultivars such as H. Macrophylla Nigra a lovely form with nice black stems and bright pink flower heads. 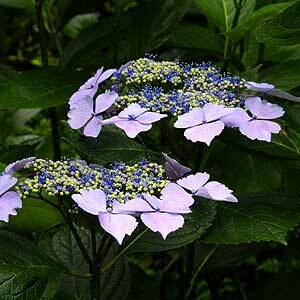 H. Macrophylla Pia is a low growing or dwarf form with purple flowers that will be blue in acidic soils. Although not difficult to care for, pruning is H. macrophylla is a little trickier than some other species. Remove spent flower heads as a general tidy up in late summer. Old or diseased canes can be cut right back, take out 1/4 of the old canes each year to promote new growth. As most of these flower on new wood, you need to cut back to three nodes below the old flower head. New cultivars are different, they flower on old wood as well as new. With flower colours ranging from white to pink, near red, blue and lilac depending on the variety and the soil, we look at a few varieties by predominant color.